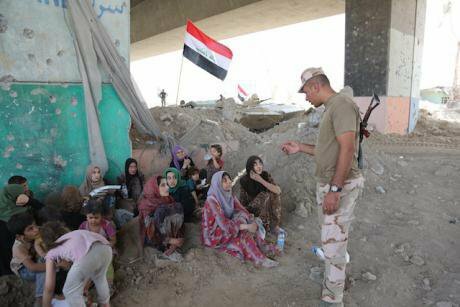 An Iraqi soldier talks with civilians waiting to be evacuated in the Old City of Mosul, Iraq, on July 10, 2017. Khalil Dawood/ Press Association. All rights reserved.As the defeat of ISIS/Daesh looms large both in Syria and in Iraq, attention turns to post-ISIS settlements: while in Syria the Assad regime seems set to remain in power with Russian support, how Iraq’s diverse political forces – which mostly self-identify along Shi’a, Kurdish, and Sunni lines – will address the deep divisions highlighted by ISIS’ rise to prominence remains a more open question. Post-ISIS nation-building will certainly require negotiation between political elites, most of which ground their legitimacy in sectarian identity, but the long-term stability of any settlement they reach depends crucially on their ability to address popular priorities and national (non-sectarian) interests. However, recent evidence from nationwide public opinion surveys shows that these priorities are not always determined by ‘identity’, as is often assumed, but are often shared across communities. For example, data suggests that in crucial areas, including security, people’s location is at least as important as identity, and that people want stability, jobs, decent services, and an end to corruption whatever their ethno-religious identity. People’s location is at least as important as identity... people want stability, jobs, decent services, and an end to corruption. Basing either domestic politics in Iraq or foreign policy towards it on ‘identitarian’ assumptions is likely to miss popular demands and priorities. Indeed, the fact that people’s concerns are not determined by their identity alone provides an opportunity to forge a socially, economically, and politically inclusive post-conflict settlement. The divisive consequences of both Saddam Hussein’s ‘Sunni-centric’ regime and the ‘Shi’a-centric’ central government which emerged in the wake of US-led regime change provide cautionary tales about the price of failing to find such an inclusive settlement, both at home and abroad. The Arab Transformations Survey, the latest empirical information from nationwide public opinion survey dates from June 2014, just before the fall of Mosul, and covers Iraq plus five other countries – Egypt, Jordan, Libya, Morocco and Tunisia. In 2014 Iraqis saw internal security and the economy as the two greatest challenges facing their country, with corruption a close third. More extensive analysis of the data suggests that for some time concerns about security have been common across the sectarian divide and higher in the central than the other regions. It also suggests that Sunnis are more concerned about totalitarianism than Shi’ites though in all regions many more people are concerned about corruption, internal security and/or the economic situation than consider authoritarianism a major challenge in their country. How such concerns will have been affected by the experience of ISIS occupation remains to be seen, particularly in ISIS-occupied areas. In 2014, people across Iraq were pessimistic about the country’s economic predicament and dissatisfied with prospects for its development. In no group or region did more than about 40 per cent of respondents expressed confidence in the future of the economy, but dissatisfaction was particularly high in the case of Sunnis, both in the Kurdish-majority northern areas and in the centre. Beyond regional or ethno-religious differences, however, such markedly low levels of satisfaction signal the urgent need for inclusive development nationwide. Regional and ethno-religious differences are important, but what is more important than variations between such areas and identity groups is that a considerable majority of the population nationwide were unhappy with the country’s economic performance and lacked confidence in the federal government’s work to improve it. While certainly posing a challenging political task, this dissatisfaction emphasises the importance of an inclusive post-ISIS economic settlement. The long-term stability of any political settlement must be underpinned by growth that is – and is perceived to be – inclusive across regional and sectarian lines. Corruption is perceived as pervasive: between 88 and 98 per cent identify it as a problem regardless of regional location or religion. Indeed, for half of respondents nationwide it was corruption which motivated them to support or take part in protests during the 2010-11 Arab Uprisings, followed by economic factors (demand for improved basic services 43%; economic problems 30%) and political factors (demanding more political freedom 25%; opposition to authoritarian leader, 23%). By contrast, even the highest levels of confidence that government will work towards tackling corruption – among Shi’ites in the Central and Southern regions, at 50 per cent and 40 per cent respectively – remain troublingly low. While politically sensitive and practically complex, tackling corruption is likely to both boost economic growth and generate considerable legitimation for the federal government and the political forces supporting it. Few social or political institutions command much trust in Iraq, often including religious leaders. However, the demand for an inclusive, representative government remains strong, providing opportunities for stable long-term solutions to Iraq’s problems. Trust in central government varies significantly along both sectarian and regional lines but is low nationwide, being highest among Shi’ites in the Central Region (32% ) and the South (37%) compared to at most half these levels for Sunnis in other regions. Low levels of trust in political leaders, however, do not translate into a lack of confidence in an inclusive form of government. Iraqis clearly favour a parliamentary form of government in which all parties – religious and secular, right and left – take part (91% among Southern Shi’ites, 83% among both Central Shi’ites and Northern Sunnis). Despite the comparatively significant drop, a clear majority of Central Sunnis (64%) still also favoured such a system. These data highlight the problems of central regions but also show that despite the intense and complex problems Iraq faces and the difficulty of reaching a negotiated compromise, a politically and economically fair and inclusive settlement would be well received by Iraqis of all religions and in all regions and would improve social, economic, and political resilience. Even before the ISIS take-over of Mosul respondents nationwide were concerned about violence: two thirds or more worried about war, terrorism, civil war, and sectarian violence. In any post-ISIS scenario, government must both ensure security and gain the people’s trust. In any post-ISIS scenario, government must both ensure security and gain the people’s trust. Iraq’s problems and politics are often viewed through sectarian lenses. However, nationwide public opinion survey data challenges received notions about the relative weight of sectarian identity in explaining respondents’ perceptions of key social, economic, and political issues. These regional variations point to the crucial importance of local conditions alongside identity. This has significant implications for post-ISIS nation-building in Iraq: it is not just ‘identity’ which politicians must represent, but people’s interests. In particular, for any negotiated settlement to be stable in the long term it must address popular demands for both economic and political inclusion. Herein lies both a challenge to conventional ways of perceiving Iraqi politics and an opportunity – if it can be grasped – to build bridges across sectarian lines. See the full briefing in The Arab Transformations Policy Briefs. No.7 from the University of Aberdeen. The research on which the article is based was funded by the European Union under FP7.